All participants are invited to a welcome dinner the first day of the workshop. This will be a night of entertainment, gastronomy and also a relaxing environment to chat with old and new friends and colleagues. For the occasion, the best Portuguese Academic Musical group (Tuna), composed by IST students, will give us lively and funny moments. 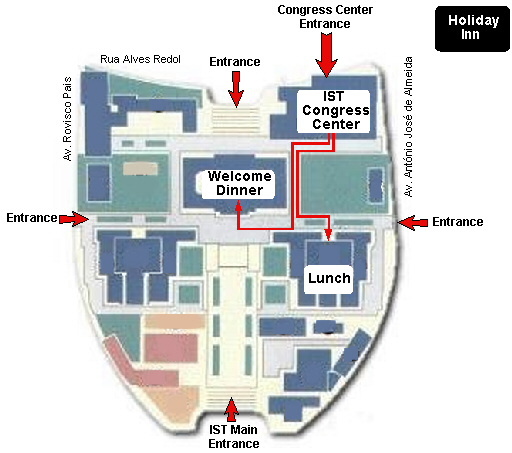 The welcome dinner will be served at the "Salão Nobre" in the first floor of the main IST building (Pavilhão Central) - see map below. In the second night, WIAMIS participants are invited for a banquet at the magnificent restaurant "Estufa Real" at the Botanical Garden (Estufa Real, Calçada do Galvão, ao Jardim Botânico da Ajuda, 1400 Lisboa, Telephone: 21 3619400). The banquet will be preceded by a guided visit to one of the most beautiful Lisbon monuments, the Manuelin gothic "Mosteiro dos Jerónimos" built in the 15th century which will open its doors at night especially for the WIAMIS participants. Transportation will be arranged to go to the banquet. The buses will leave from the workshop site at 6.30 pm and should return to the same place around 11 pm. .